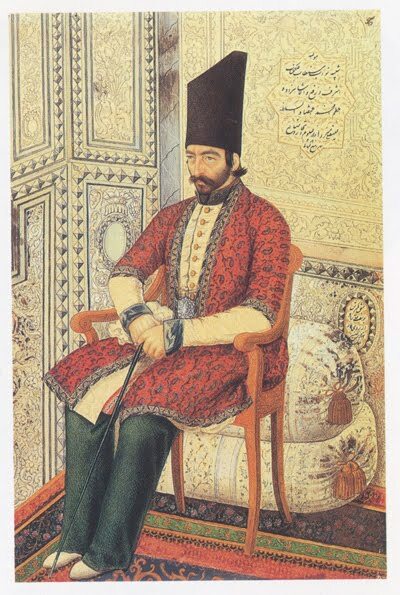 The young bearded man sits on a wooden chair, holding a walking stick in his left hand and wearing a tall black hat, an elegant red jacket with nice motifs, and green trousers. The background details such as floor cushions and panels on the wall look nice as well. Links 2 and 3 also show a similar portrait of him next to a window. It is hard to know which one is authentic. 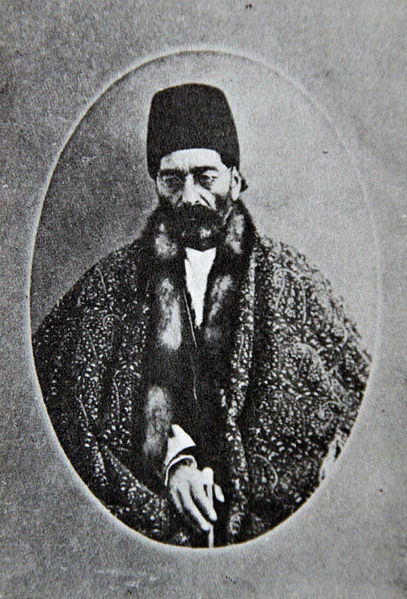 Prince I'tizad al-Saltaneh was the 54th son of Fath' Ali Shah of Qajar. He was the minister of education and science for 22 years as well as the head of Dar ul-Funun College during which he contributed greatly. He seems to be the first person who translated Newton's laws of mechanics into Persian. He also served as Minister of Telegraphy, Industries and the head of state's printing office at various times. I consider him the Iranian version of Benjamin Franklin.